» Death Noted: JIM GOODRICH (1927-2009). Death Noted: JIM GOODRICH (1927-2009). 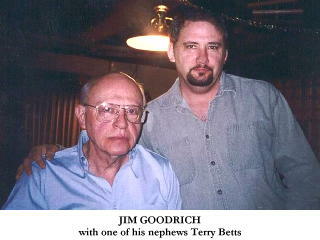 Jim Goodrich, a good friend of mine died this morning. He died peacefully in a Albuquerque hospice around 1 a.m. His daughter Jill and her husband Kevin were at his bedside. He was 81 years old. Jim was an avid mystery reader and an equally avid movie buff, and he had been all his life. I’ve known him for something like 35 years, and while he never wrote any long articles or reviews for Mystery*File, he was always a strong supporter of my efforts from the first issue on. He invariably had something to say about the previous issue in the letter column of the next one. I met him in person the first time at the 1977 New York City Bouchercon, and we became even closer friends as time went on. We drove together to a PulpCon in Cherry Hill NJ in 1981 — he still lived in New Paltz NY at the time, where he was an academic librarian — and we attended several Friends of Old Time Radio conventions in Bridgeport CT and Newark NJ together, always having many many things to talk about and to catch up on. After he retired and moved to New Mexico, we only saw each other at PulpCons, either in Bowling Green or Dayton OH once a year, but we kept in constant touch, first by letters and postcards, then by email. Our interests overlapped in mystery fiction and pulp magazines, although his centered primarily on the hardboiled kind; old-time radio, movies, traditional jazz, religion, politics, and you name it, pop culture and nostalgia of every kind and variety. Jim had been undergoing radiation and chemotherapy treatments for the past several years, but he was a cheerful survivor. He was, in fact, planning to attend PulpCon again last year, but he was hospitalized the weekend before, a sore blow to him. He wouldn’t have missed it otherwise. He never went home again. He was transferred to a hospice within a week, but he rallied and was moved to a place where he could receive physical therapy, and he spent the last six months of 2008 there. From December on, his condition deteriorated again rapidly. GOODRICH — James R. “Jim” Goodrich, 81, of Albuquerque, died February 7, 2009 after a three-year battle with cancer. A retired librarian, Jim was an aficionado of Jazz, Cinema, Art, Pulp Fiction, Mysteries, and Comics; and an active supporter of numerous progressive causes and candidates. His intelligence, dry sense of humor, and patronage of numerous local restaurants, bookstores, and other establishments earned him many friends and admirers in the area. Jim was born in Toledo, Ohio, on September 12, 1927, the son of the late J.R. and Florence Goodrich. He earned a Bachelor’s degree from the University of Toledo and a Master’s of Library Science from Rutgers University. In 1990 he retired after more than 20 years as a librarian at the State University of New York at New Paltz and moved to Albuquerque. Jim is survived by his daughter, Jill Goodrich, and her husband, Kevin O’Connell, of Silver Spring, Maryland; his son Victor Goodrich of Philadelphia; his sister and brother-in-law, Lois and Edward Betts, of Northridge, California; his nephews, Tom Betts and Terry Betts, of California; and his niece, Ellen Betts, of Arizona. He was predeceased by his son Scott in 1974. Burial will take place at a date to be determined in New Paltz, New York. Donations in Jim’s name may be made to Presbyterian Healthcare Services (Albuquerque) Hospice division, the American Cancer Society, Planned Parenthood, or any environmental or wildlife charity. Thanks to Terry Betts for allowing me the use of the photo above. Very sorry to hear this. I met Jim at a couple of Bouchercons and of course knew him through mystery fandom for years. My condolences to his family. Thank you, Bill, and everyone who’s emailed me privately. I’ve let his daughter Jill know how many friends in mystery and movie fandom he had. She knew this, but she was glad to be reminded of it again. I was one of Jim’s nephews. He would have very much appreciated your obituary as he was a devoted fan of mystery books. For myself and the immediate family I thank you for your kind words and sentiments. RIP Uncle Jim you will be missed. I knew uncle Jim,maybe not as well as I wish I could have.He would come every x-mas and I got to see him then,but I never talked much with him.I only wish I could have gotten to know him better.At least he can read all he wants now. Jim’s has been noticeably absent at the pulp collector gatherings this year. When I started my small press operation Black Dog Books, some years back, Jim was an early patron, and always interested in what new titles I had, sharing some advice from his years as a librarian. I’ll sadly miss his broad smile and sense of humor. I’m a former neighbor of Lois & Ed Betts, the sister and brother-in-law to Jim. I got to become a good friend of Jim’s and I have to say I miss that he’s gone.